Peter Longa, surrounded by many of his nursing colleagues. 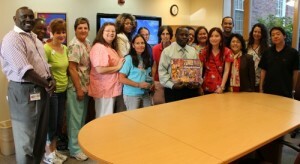 He’s holding a congratulatory painting created by Pearl Chiang, a nurse-artist, standing to his left. Peter Longa, a native of Sudan who was forced by civil war to leave his country in 1991, joined Matheny as a personal care assistant three years later. A recipient of a Matheny Nursing Scholarship Award, Longa received his nursing certificate from Raritan Valley Community College in North Branch, NJ, and, while there, was awarded the Joanne Nitcheky Sergeant Award for excellence in clinical nursing. In 2006, he was selected to receive the Governor’s Nursing Merit Award in the Registered Nurse Post Acute Category. 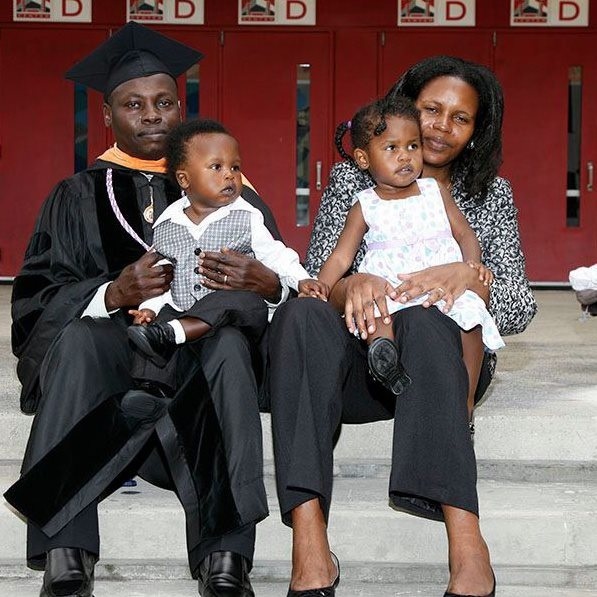 Longa earned an MSN at the University of Medicine & Dentistry of New Jersey and recently completed his doctorate in nursing practice program, also at UMDNJ. Since 2010, Longa has been the night nursing supervisor at Matheny, and on one recent morning, as he was preparing to leave for home, his colleagues surprised him with a congratulatory breakfast. Longa, after receiving his doctorate, accompanied by his wife Poni, son Tomor and daughter Sophia. This entry was posted in Uncategorized and tagged Joanne Nitcheky Sergeant Award, nursing scholarship award, Peter Longa. Bookmark the permalink.